So it's been about a year since I went totally off my rocker and decided to start stockpiling food. 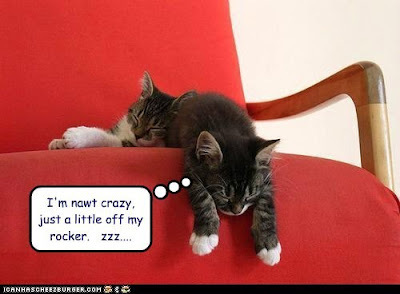 Honestly, when you walk down the aisles of the grocery store - brimming with more food than one can really comprehend, well, I do think I'm a bit crazy. Like, why would people living in the land of plenty possibly need to worry about running out of food? Perhaps I am just nuts, and that would be the best possible scenario, but on the off chance that I'm not, it does give me some level of comfort knowing that food is one thing I won't have to immediately worry about should something bad happen - whether it's economic, environmental, political, or who knows what. Plus (and now you'll know that I'm REALLY crazy) I am having tons of fun with my food stockpile! First of all, it's soooo nice not to run out of things. Like if I'm cooking and I run out of olive oil, I don't have to panic - I just run downstairs, grab another bottle, and add it to the shopping list to replace the one I took out of storage. And then there's the system. 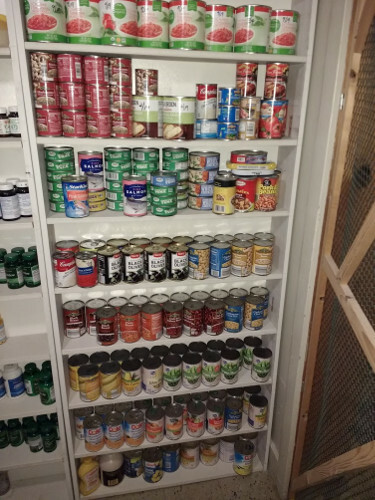 This is the part that I was really missing in my previous attempts to stockpile food - you can't just buy stuff willy-nilly and shove it in a closet somewhere. You have to have a system for rotating and using up your stock. 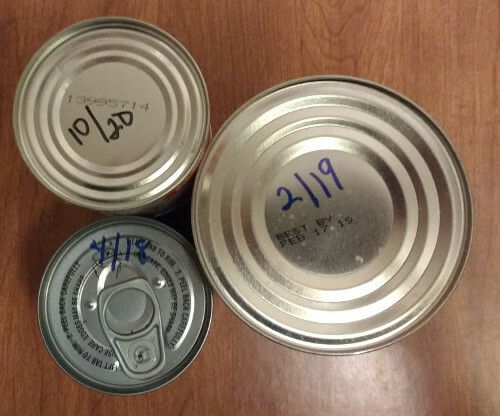 Soooo... when I buy stuff now, the first thing I do is mark the expiration date on the can or jar. I know the date is already on there, but making it clearly visible at a glance makes the whole process WAY easier. Then when I'm putting it away, I take that opportunity to do a bit of rearranging. I put the new stuff in the back, and check for anything with an approaching expiration date. I bring anything that needs to be used soon (or that I'm planning on using soon) upstairs, and put in in the kitchen cabinet where it can get used quickly. It's a bit like a never ending pantry challenge - which I consider to be great fun. I currently have some cream of mushroom soup and frozen peas that need to be eaten... so I see some tuna noodle casserole in my future! My original plan was to try to stockpile a year's worth of food. Honestly, figuring out how much that is... well, let's just say that was a challenge. 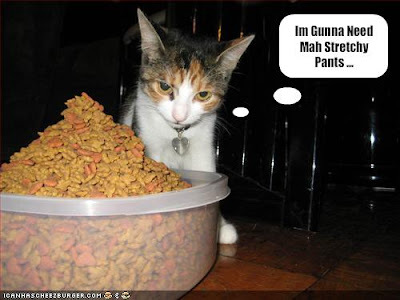 There are prepper sites online that offer guidelines, but they varied wildly, and some of it was downright comical. One said you needed 5000 calories per person per day. Seriously?!? I guess they're planning to burn a lot of calories during the apocalypse. Well anyhow, my general approach is to just try to store enough short term food (like stuff that keeps for 1-5 years) so that I can eat it before it goes bad and continue rotating. With the longer term stuff (stuff meant to be stored for 20-30 years) - well, I bought some of that too, and honestly I haven't really figured out the best plan for making sure I use it before it goes bad - but hey, I've got a while before I really have to worry about that one. So... here's what you've been waiting for. The crazy lady pictures - ordered by descending craziness level. 1) The canned food shelf. 2. Pantry Cabinet number One. 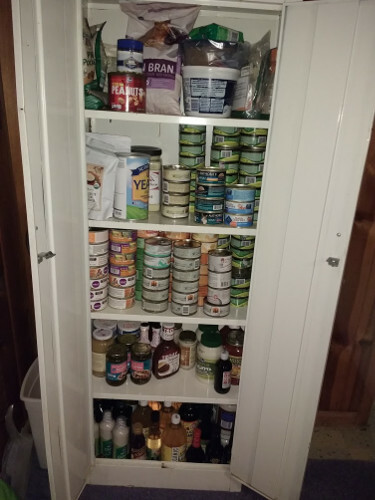 This cabinet stores the canned cat food as well as other short term stuff - especially things that needed more sheltering from light than the canned stuff, or stuff that wouldn't fit easily on those shelves. 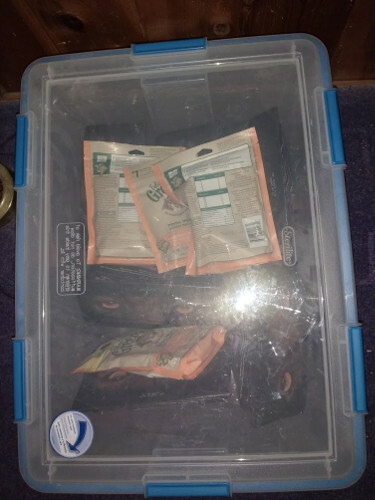 And while we're talking kitties - I used an airtight plastic bin for storing bags of dry cat food. 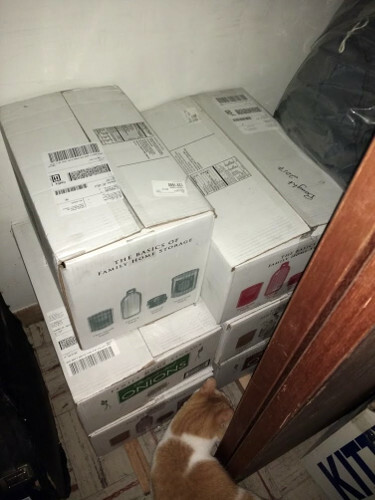 I figured it would keep out any mice or bugs, as well as any kitties who decided they wanted to open a fresh bag for themselves - which isn't really as out of the question as it might sound... ask me how I know! And then we have this cabinet, which stores mostly dry goods. 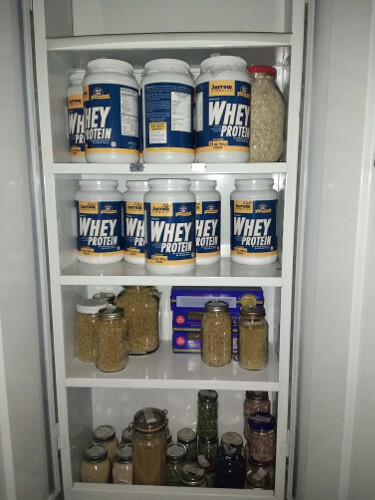 Only one of those shelves is actually full of protein powder, the other one is old protein powder containers filled with oatmeal. There's also pasta and dried beans and some random grains like millet and quinoa in there. Note the empty shelf on top! Always room for more! Now we're getting to more long term stuff. 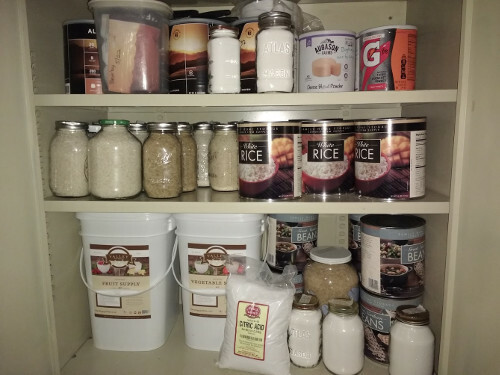 The white rice (there's Jasmine, Basmati, Parboiled & regular) will theoretically store for 10+ years in glass jars, and there's also sugar & Gatorade, and then stuff that I bought both from the Mormon church and various prepper sites - there's some beans & rice as well as freeze dried fruits, veggies, cheese, butter, milk, and even some chicken. And then we have the deep storage. This is all stuff that I ordered from the Mormons. It's all 30 year long term storage stuff including dried onions, potatoes, beans, apples, rolled oats, and milk. And that's about it... except for... the freezer! Oy! This is one area where I really need a better system. It's the shape of the darned thing that makes it so hard to keep it organized. My current system is to try to have a bag for each category of food - breads & flours, meats & meat alternatives, cheese & butter, and fruit & veggies. But as you can see... I'm not doing a very good job keeping up with it - it's just such a pain to pull everything out when you need to get something or put something away. 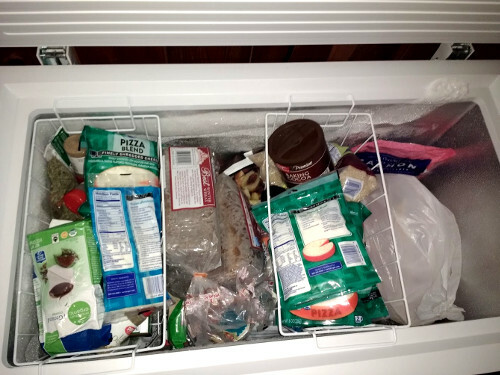 So if anybody's got any suggestions for better freezer organization - I'm all ears! So that's the news from the crazy lady. I'm curious if anybody else out there has dabbled in food stockpiling. I'd love to hear about your systems if you have!